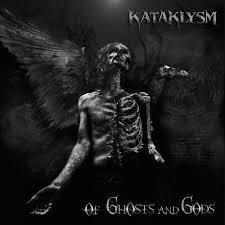 Kataklysm – Of Ghosts and Gods – Nuclear Blast – Release: Out Now. It all started in 1992 in Quebec, Canada. Kataklysm comes into existence and becomes one of the biggest extreme metal acts from the Canadian surface. With their consistence in hard labor and high quality metal they built a worldwide fanbase and became a big household name for extreme metal. Their previous effort was “Waiting for the End to Come“ from 2013 (check effe). Now just two years later and fueled by their loyal fans Kataklysm is already back with another great classick in the bag! Classic? Yes, I dare to name “Of Ghosts and Gods “ a classic. It has all the ingredients to become one. Strong bold riffing, stelllar song structures and a more modern metal sound this time around gives this record something special. The boys from Kataklysm found more room for diversity instead of being kings of the blast beat again. They really tuned down the amount of blasts compared to their previous records. You might expect that Kataklysm somehow commited suicide with stepping away from that part of their specific sound. They somehow grew into a more mature sound. It feels like they let their old school roots a bit behind them and moved on with a more modern approach. I feel the shivers run down many Kataklysm fans. I said modern and don’t mean the fancy new name for deathcore. Don’t worry; it’s still good old Kataklysm, it’s just more diverse and interesting. At least for me it is. Kataklysm could have easily done the same trick they have somehow done for the last 20 years and still sell enough. Kataklysm show they’ve got balls and changed their formula a bit. It worked out great and somehow even made my love for Kataklysm a bit bigger than it already is.